CBBH Photo Challenge: Looking forward, looking back. White rabbits! 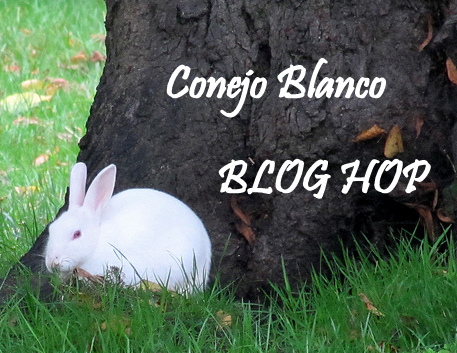 Conejos blancos! Yes, it’s that time of the month again ….. soon comes round, doesn’t it? I got lots of comments about my snow photographs in the CBBH Photo Challenge for April: FULL CIRCLE – but there was the grand total of one entry, apart from mine. Thanks Le Drake Noir – even though something did get lost in translation! What was it you didn’t like, I wonder? Did the challenge involve taking too many photos – or couldn’t you find the right place to spin around? Well …. I had fun, anyway – in fact, I enjoyed it so much, I have a similar challenge for this month, except that this time only two photos are involved. This month’s CBBH Photo Challenge is LOOKING FORWARD, LOOKING BACK. All you have to do is take a photograph and then turn round and take another of what is behind you. 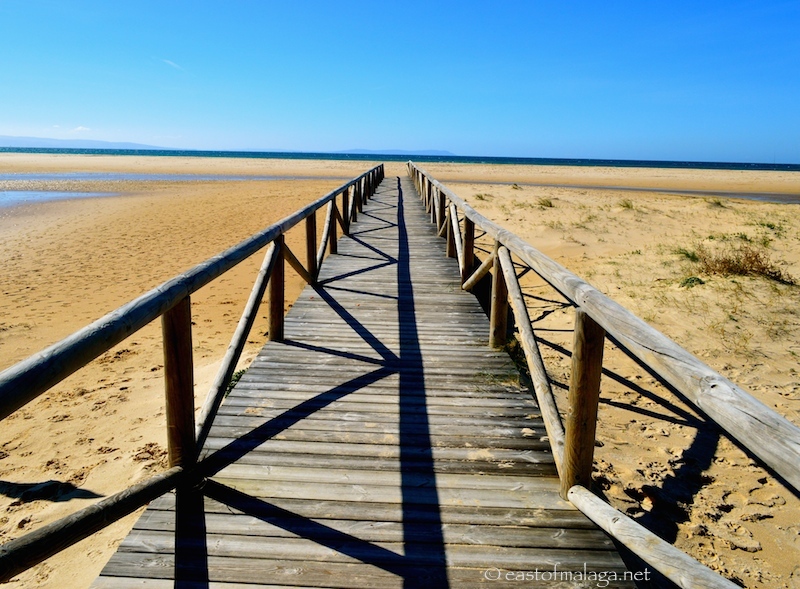 This is the gorgeous natural beach area of Playa de Los Lances, near to the town of Tarifa on the Costa de la Luz. At exactly 36 degrees latitude, this is the southernmost point of the European continent, situated even further south than both of the African capital cities of Tunis and Algiers. If you look carefully at the first photo, you can see the mountains of Africa on the horizon – while the photo below shows the much closer Spanish mountains. I love these kind of walkways – especially with the shadows of the rails forming such a distinct pattern. *** Have you ever thought about walking the Camino de Santiago? Maggie, the Trepidatious Traveller, only lives a hop, skip and a jump from me in La Axarquía, and yesterday she flew to Lisbon in Portugal to begin the Camino Portuguese. Last year, Maggie walked the 950 kms of Camino Frances from St Jean Pied de Port to Finisterre with her daughter over five week period, so at least she knows what she’s letting herself in for. You can follow Maggie’s daily posts (she sets off from Lisbon on May 2nd) or donate to the two charities she is raising money for (Cudeca, which is the Spanish cancer charity or Action for Animals). Buen camino Maggie! *** Writer, Patricia Sands, says that everyone has a story and her’s involves Antibes in the south of France. Through her blog you can join The Bridge Club – Patricia’s acclaimed debut novel, or simply become immersed in her love of writing and escape to her beloved France. If you love writing, you’ll find lots of information about writing here, as well as having the chance of winning prizes that are regularly offered. So that´s the CBBH Photo Challenge for May, everyone. This entry was tagged Andalucía, CBBH Photo Challenge, Europe, life, One trip EVERY month, One trip EVERY month Challenge, photography, Spain, summer, travel. Bookmark the permalink. Oh no, I think my link got lost! Ah, yes – I know that feeling! A new camera? How exciting! Well, well, well…look at that…third in line to post for the month. BTW…so addicted to Maggie’s posts. I gave her an extra shout out as well. Glad you’re enjoying Maggie’s posts. Inspirational, isn’t she? Great pictures, Marianne with unexpected views. I learned some geography. I like the sound of this challenge. I shall be taking my camera out with me (and the dog) tomorrow. Thanks for getting in touch and I look forward to seeing what you see. Ha! Spot on – well done! I’ve already been out practising with my camera, and I have a few ideas for interesting shots. I love these two way shots Marianne … I know I have some like that .. but where ? I am a bit distracted trying to get the house and garden ready for our trip away which is almost upon us …. I wonder if we will see this very view?!! I’m sure you are getting excited, Christine. 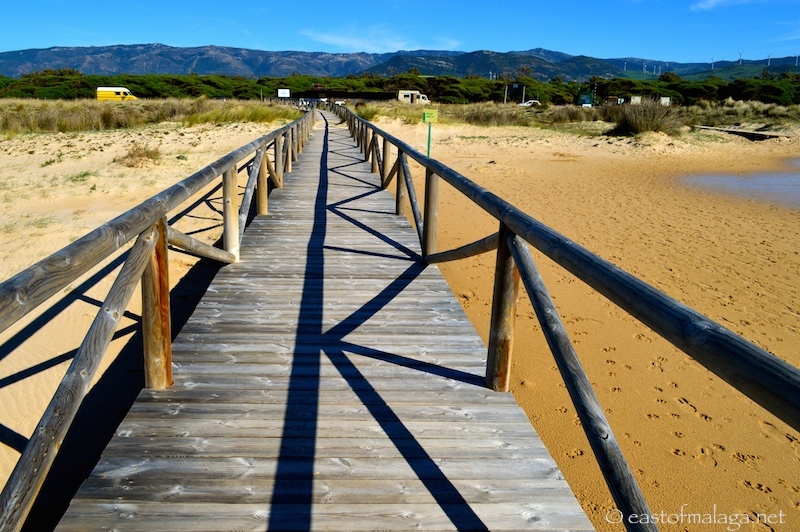 Yes, you might see this view because I’m sure you told me you are heading for the Costa de la Luz. It’s a lovely, natural area. Love both your images Marianne. I did want to do last months challenge but nothing I shot satisfied me. But will look for something interesting for this month. Thanks for the blogs…both fascinating. You’ve had other things on your mind, Jo. Hope your preparations go smoothly, Sylvia. Fabulous Marianne! I shall give it a go this month! This is such a fantastic idea for changing things up with our photographs! Thanks for the heads up, I’ll definitely be trying this in the near future. What a great bridge – I was really taken by the zigzagging shadows. It’s sad that you didn’t have much response last month. For my part, I couldn’t think of any blogs to recommend because I’ve stopped reading around. Too time consuming right now. At the moment I’m happy with your other challenge, once a month! Hmmm …. that was something I thought about, Trish – being able to recommend links month after month. I guess at the beginning (almost two years ago) it was quite easy, but as time goes on it does get more difficult. I wonder if I should ask people to link to just one other blog rather than two? I would hate anyone to be put off the rest of the photo challenge because of this. Or maybe the CBBH Photo Challenge (in it’s current form) has run it’s course and I should concentrate on the One Trip EVERY Month, instead? Great pictures Marianne. It’s amazing to think Africa is withing sight of a European mainland. Great idea Marianne, just checked out both blogs and now following. Might try and have a bash at the CBBH photo challenge. Buen Puente! I love your pictures! I like how it leads the eyes to the centre and I’m also very envious of the location! It’s a lovely part of the world – that’s for sure!